You already know that you can rely on James Spring for an extensive selection of specialized springs for almost every industry. But with our history of designing and manufacturing springs for more than fifty years, we can also offer our valued customers a wealth of valuable information and interesting facts about the springs they use every day. Today we’re thrilled for the opportunity to discuss the unique traits of one of our best selling products, torsion springs! These powerful springs can come in a wide range of sizes and configurations, making them ideal for applications in many different industries, as well as many products that may surprise you. Before we examine the more complex details of these popular springs, we’ll begin by offering an overview of what makes these springs different. Torsion springs are helical shaped springs that exert a torque or rotary force. Each end of a torsion spring is attached to other components, and when the components rotate around the spring’s center point, the spring will try to push them back to their original position. If you’re trying to imagine an example of a torsion spring in your everyday life, just picture a clothespin! When pinched, the torsion spring between the wooden pins gain resistance, giving it the pressure to pinch back on the garment you’re hanging on your clothesline. To serve their intended purpose, torsion springs can be either closely wound or have a pitch to avoid abrasion in high friction applications. 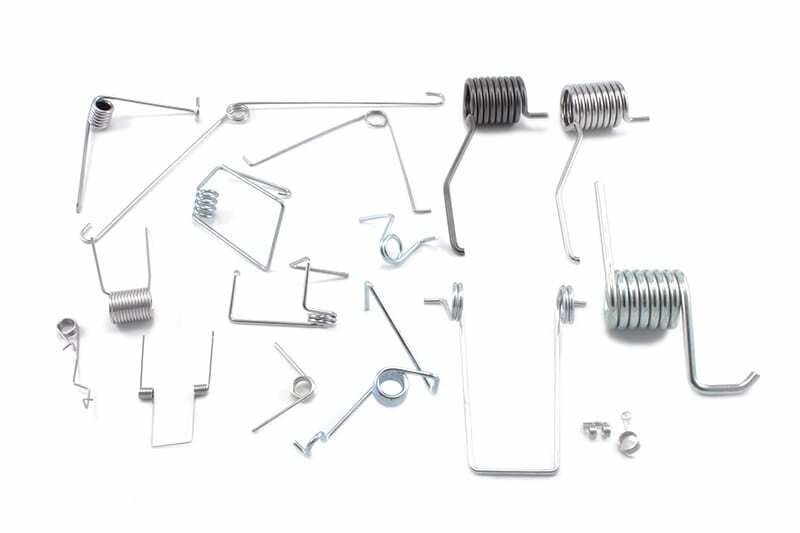 Torsion springs can be made in all sizes, and can be wound to work in either a clockwise or counterclockwise rotation. Additionally, torsion springs can be configured to attach to components in different ways, including custom leg angles, lengths, and end styles. What Applications Require Torsion Springs? Torsion springs can be found in numerous applications spanning nearly every industry, including medical torsion springs! You wouldn’t know it, but these useful springs can be found in items you use every day like clipboards and garage doors. Since torsion springs can be manufactured in nearly any size and with differing degrees of stiffness (also known as spring rate), they play an important role in a wide range of applications. From our earlier example of a clothespin to a common hand grip strengthener to larger automotive applications, the uses for torsion springs are nearly limitless! Put simply, the most important factors of torsion spring performance are spring rate (which you learned about in our compression springs blog), deflection, load capacity, and wind. In a torsion spring, spring rate accounts for the return of angular torque per unit of angular displacement. Deflection is the amount that the spring resists pressure before overstressing itself and becoming damaged (bent), and the wind is simply how the spring is wound, be it right (clockwise), left (counterclockwise), or with double torsion. Here at James Spring & Wire we can fabricate the perfect torsion spring for your unique application. We specialize in manufacturing high-quality single-bodied and double-bodied torsion springs options of different end configurations including straight, offset, and even hinge ends. When you contact us for torsion spring, we’ll consider your custom application needs, then produce the ideal torsion springs for your needs. From medical torsion springs to automotive torsion springs, our springs can be produced with wire diameters ranging from 0.005″ to 0.250″, and designed to rotate either counterclockwise or clockwise. No matter what the specifications of your application, a custom torsion spring can be manufactured to suit your needs. Contact James Spring today to get started!